Whether you’re collecting Starbucks Star Rewards, Swarm Perks or any other rewards or incentives offered by any number of companies, customer loyalty programs have become extremely popular in recent years. And increasingly, customer loyalty programs remain a point of differentiation as competition intensifies, especially in the hospitality and hotel industry. More and more hotels now offer customer loyalty clubs in an effort to increase direct booking with repeat guests and build their brand. It’s easy to create an effective hotel customer loyalty program. And you don’t even need to purchase a specific loyalty program. Here are the simple step-by-step instructions for building a hotel customer loyalty program using Zoottle’s WiFi service and an email marketing platform like Moosend. With Zoottle’s platform, you can obtain almost 99 percent of visitors’ email addresses. Porto Carras, a luxury resort Greece, used to collect just 1,300 valid email addresses in a season. Thanks to Zoottle, in the following season they managed to increase that number ten-fold – collecting 15,000! Nest, connect Zoottle to your Moosend account. Your guest email list will update in real-time with valuable information that Zoottle automatically collects – like when they logged on to WiFi for the first time, how often they visited the hotel, demographic details such as gender, age, or country, and even their degree of satisfaction with services within the hotel. From your Moosend account, go to Account > API key, and copy the key that is generated. Alternatively, you can also MailChimp, but the cost will be two to three times higher. The good news is that any of these campaigns can be set to run automatically based on the information collected by Zoottle. Your guests will receive relevant marketing messages while your hotel enjoys peace of mind knowing regular emails are going out to encourage return guest visits. Don’t have a graphic designer on-staff? No worries! 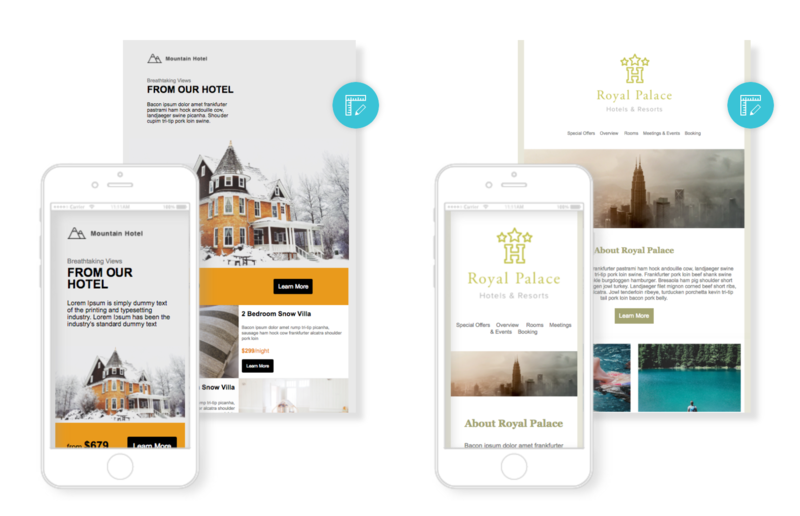 Moosend provides ready-made email newsletter templates for hotels, like this, which you can customize to your own design in just a few clicks. Or, you can have one of Moosend’s graphic designers create a template exclusively for your hotel’s campaign. Take a look at how easy it is. Another important aspect is to create a web page that is only accessible for guests through your loyalty communications. You can ask your website developers or programmers to create a ‘hidden page’ for these special offers. Or, if you don’t want to create more pages on your website, you can also use your booking engine – like Webhotelier – to make exclusive offers appear in your reservation system. Just create a special code or voucher. Then send that code to your guests as part of your loyalty campaigns, and they’ll be able to claim it. All of this information, like how many opened the email or how many visited the website, is available via the Moosend platform. You’ll also want to include the Moosend tracking code on your website so you can see which guests/email recipients ultimately make a reservation. And if you have different categories of rooms and services, you’ll also be able to see which corresponding pages they visited. As you continue to collect additional information about what guests were looking at on your website, you can send additional, automatic emails based on each guest’s interests. To make your loyalty activity even more effective, create Facebook ads aimed only at your guests. Follow this step-by-step guide to create a Facebook targeted ad campaign. You can also run remarketing ads on Google for guests who searched for your hotel or your area after they have checked out. As an example, each time an existing customer searches for related keywords to your hotel, they’ll see an ad with a loyalty offer that invites them to book direct through your website with a 10% discount on your OTA prices. If you have any additional questions about building your hotel customer loyalty program, contact us at hi@zoottle.com.